Every brand has some services that are their creation. They might do really well but the most important factor that cannot be ever neglected is the customer’s need. If a brand is able to modify itself according to what most of its client’s look for, it can overcome any problem in no time. This is sort of strength for a brand as it can keep its customer’s happy and satisfied and is also into experimenting a lot of things. In a conversation with Green Trends for our Indian Salon and Wellness Yearbook 2017, we get to know how the brand works, their course of expansion and the factors that define them. An entity of Trends in Vogue Pvt Ltd, a group company of CavinKare Pvt Ltd, Green Trends salon caters to the mass premium segment. Green Trends distinguishes itself through its seamless understanding of a common man’s styling needs and offering services, both contemporary and trendy, that best befits his statement. Pioneering the concept of ‘Family Salon’, the brand focuses on personal attentive grooming with an accent on natural products at an affordable price. A brainchild of the renowned conglomerate, CavinKare Pvt Ltd, Trends in Vogue was set afloat to handle the retail salon space. A pilot study of various orientation and needs of the product and services business led R. Gopalakrishnan - Business Head, to come up with an initial setup, a men’s salon under the name ‘Greenie’ in 2000. The success recorded by the channel triggered the brand to establish its first ‘Family Salon ‘in 2002. 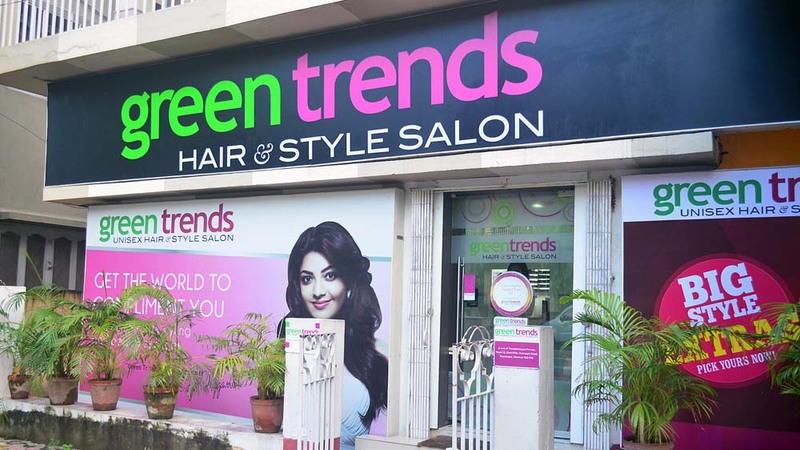 Since then it’s been a journey to reckon with, and post a decade in the beauty business, the brand rechristened itself as “Green Trends Unisex Hair & Style Salon” in 2010 to cater to the growing needs of its customers and operational expertise. Though the plan was always on a salon chain model, it was only in 2011-12 that expansions took place; opening up to franchising the approach received an overwhelming response with the brand, currently, housing 350+ salons of which, 220+ are Franchisee owned. The major challenges faced were a deficit in skilled manpower, low concentration of training institutes and real estate upheaval. The brand counterfeited the above by imparting regular training sessions to their staff across India, upgrading them in current beauty and styling trends at par with international standards. The brand took an extra step, working with colleges to enhance the quality of beauty education. This apart, the brand associated with various Academies, government bodies and NGOs to extend Skin and Hair Certification Courses to salon service providers. Green Trends caters to the needs of over three lakh customers each month via its centres spread across 55 cities. Offering a wide range of innovative services, the brand delivers current styling trends using best-in-class products at prices 25-20% lower than premium salons in an equally good ambience. The courteous staff and their dedication to abide by company values, striving towards customer satisfaction, are applauded. While the brand has several memories itched fresh in its scrapbook, the most special remains the launch of its 100th centre, a major feat since its inception. The salon chain went ahead to be the industry firsts to produce a TV commercial besides providing Employee Welfare benefits (PF, ESI and medical claim) to its employees. Associations with industry experts like Blossom Kocchar, Mary Ann, Jawed Habib, Marvie Ann Beck etc and the success of its employees at organizations and brands such as CMO Council Asia, NDTV, Franchise India, L’Oreal, NSIC ICRA and CRISIL Rating are milestones the brand stands proud of. For the financial year 2017-18, Green Trends has plans to launch new services and products besides expanding 75 salons through COCO-FOFO ((Franchisee Owned Franchisee Operated). “As a corporate we provide 360-degree support to our Franchise Partners, offering a foolproof business model with assured business opportunity. We also work towards helping them have an operational break even within six months of starting the business,” asserts Gopalakrishnan.